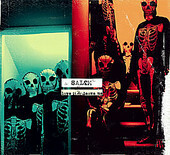 Gainesville, Florida quintet Salem's gritty approach to punk rock is captured on the five-track Love It or Leave Me. Rounded out with a decisively heavier handed attack than your average punk group, Salem has much in common with fellow statesmen Hot Water Music and Avail, wielding sinewy and emotive tunes like "Confession" without the whiny aftertaste. Salem's punchy guitar lines such as the one found in "Aphrodite's Tears" meld the elegance of The Cure with the firepower of Thrice, making this band an outfit that knows how to keep it heavy without losing its head.